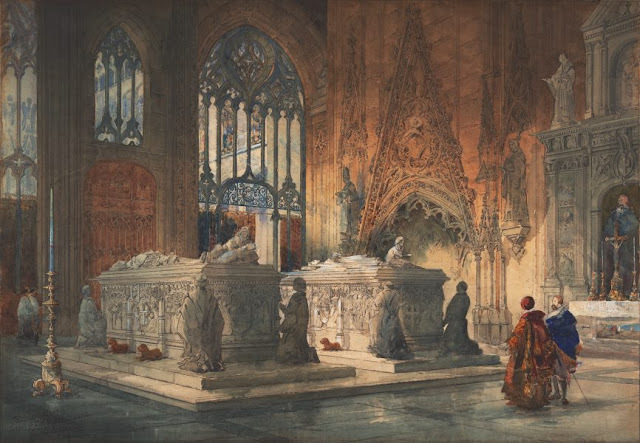 iconoCero: Victorian Watercolours en la Art Gallery of New South Wales, Australia. 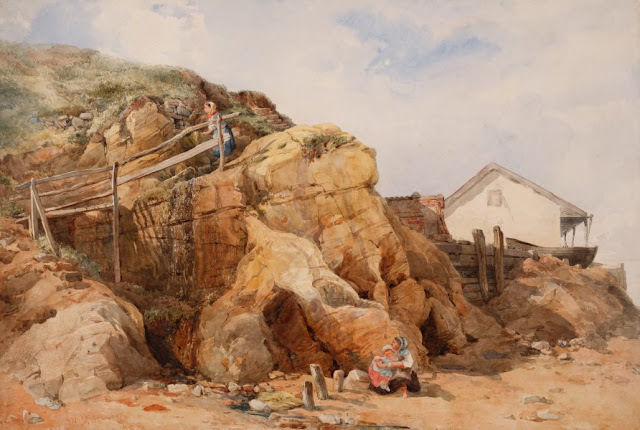 Victorian Watercolours en la Art Gallery of New South Wales, Australia. 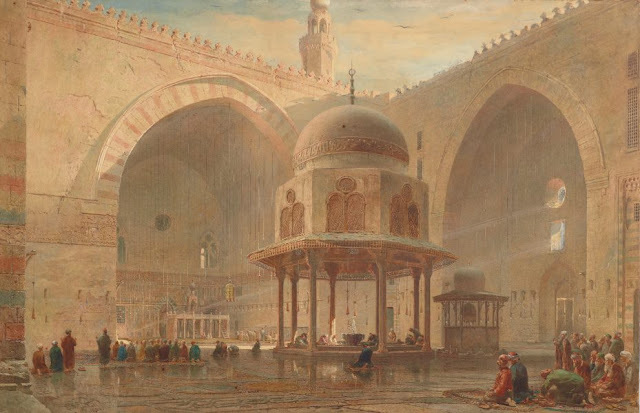 Main museums and galleries have opened their venues to a class of disappointing contemporary expressions of something they call art: video installations of blurry bad taken images and rumbling mostly inaudible sounds, all in a dark room or empty space with a screen; or maybe a wall where the “artist” pin lots of messages of protest written in cheap papers that are exhibited with high honors and proud; and what about drop a millenarian vase in front of people as an act of liberation, or dress the columns of a museum with life jackets… eccentric fashion clothes for a kind of activism, not art. 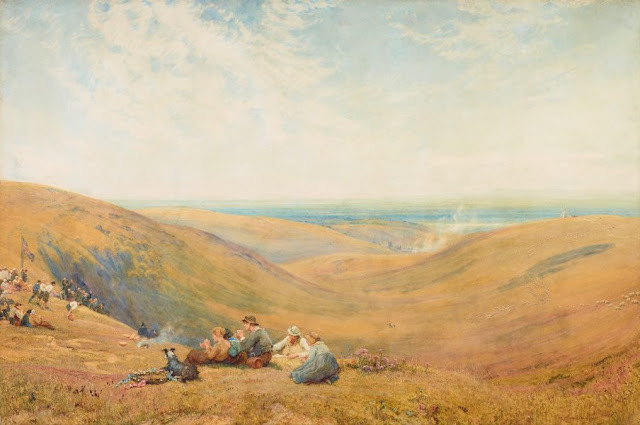 “Victorian Watercolours”, exhibition at the Art Gallery of New South Wales, Australia, is the opportunity to admire a sort of work that is almost extinct as an art practice. 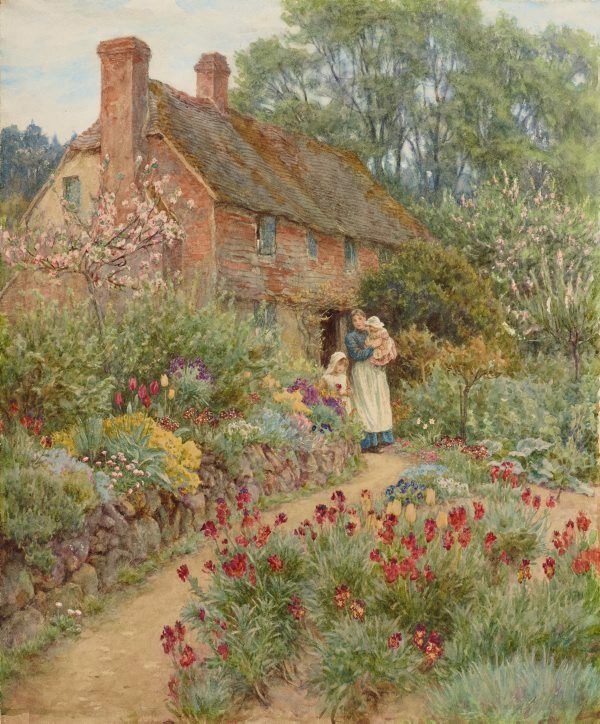 Young people do not feel attracted to, and is major seen as a women technique to depict flowers. Around 80 watercolours from the XIX century, part of the artworks collection of the gallery will demonstrate to new audiences the possibilities of this technique. The group of watercolours has a primary essence in high quality drawing ability to catch the beautiful tessituras of landscapes, edifications, palaces, ships, gardens and cities. The depictions go through a variety of subjects where the translucent property of the color is used to enrich with splendid taste the canvases. All of them are a master class of real art. 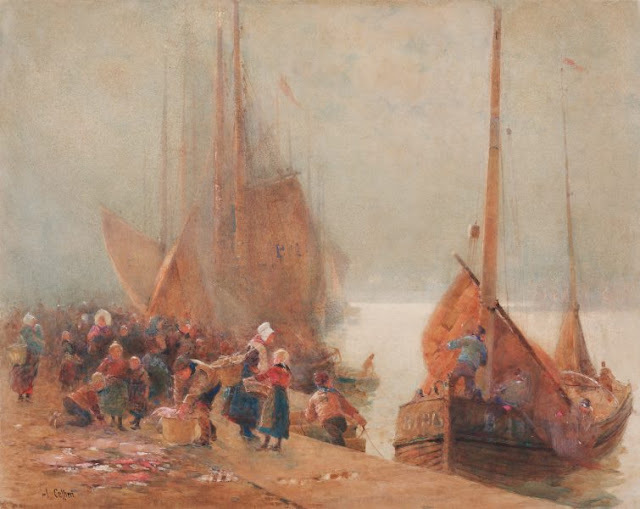 In the exhibition, we could admire the furious impatient sea as a witness of implacable whale anglers, the peculiar joy that flows into the air of a morning in the downtown market place. Also, we could contemplate the beautiful sandy tones of an ancient mosque in Cairo, or the showy attires of a Cardinal at intellectual fight against the humble, modest garment of a priest during a game of chest... or maybe see and feel the mixture of individual success and calamities occurring to the people at St James Park, a foreplay of what street photographers will pursuit in next decades… and finally, be immerse in the calmness of the subtle blue tones of the Lake Lucerne. “Victorian Watercolours” is open until December 3, 2017 as part of an extensive conservation project in the Art Gallery NSW, Sydney Australia. 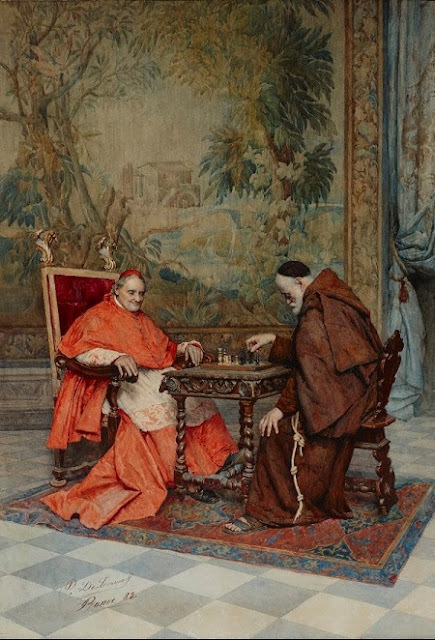 "The game of chess" by Publio de Tommasi, 1882. 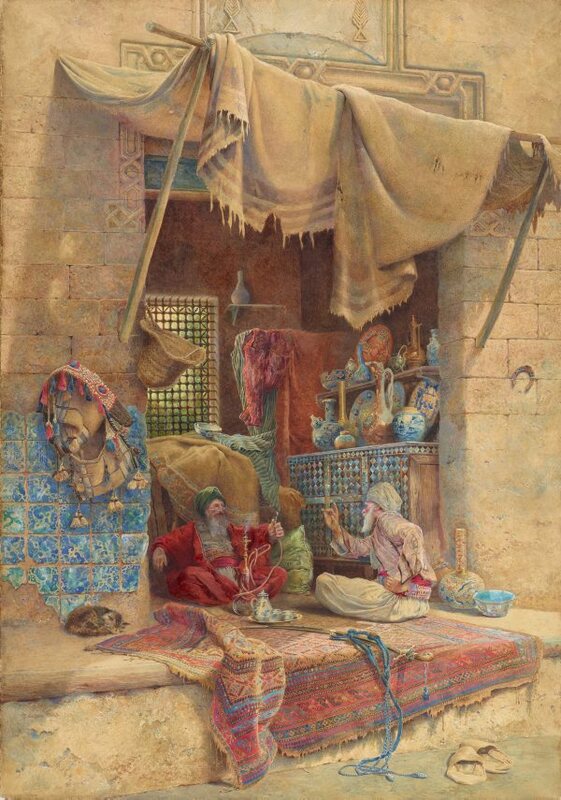 "Bazaar gossip" by Charles Robertson, 1886. 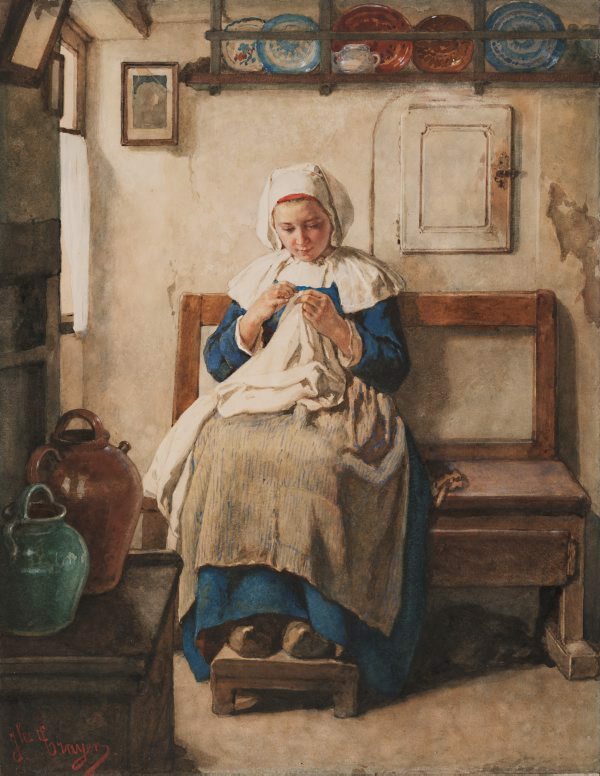 "Breton peasant girl" by Jules Trayer, circa 1870s. 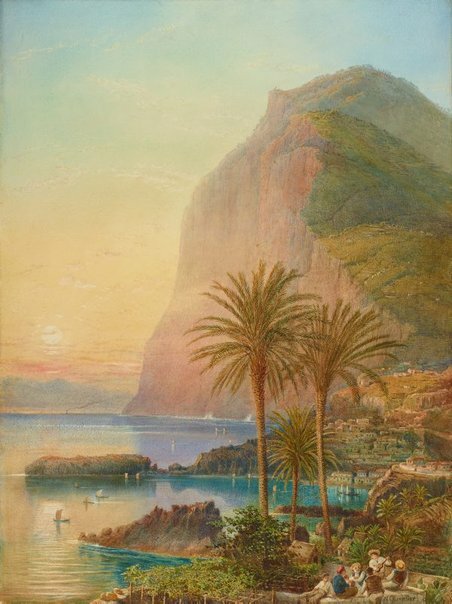 "Cape Girão, Madeira" by Nicholas Chevalier, 1895. "Hillside cottage" by Helen Allingham, 1889. 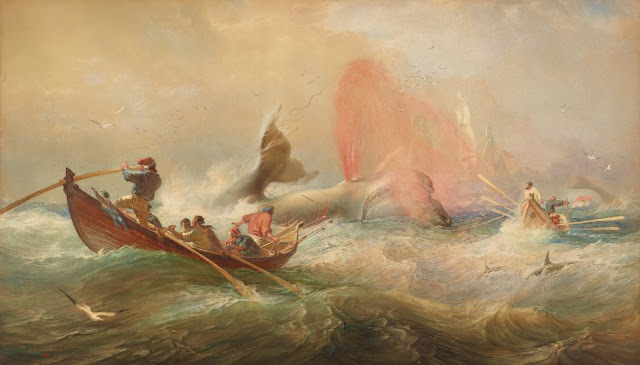 "Whalers off Twofold Bay, New South Wales" by Sir Oswald Brierly, 1867. 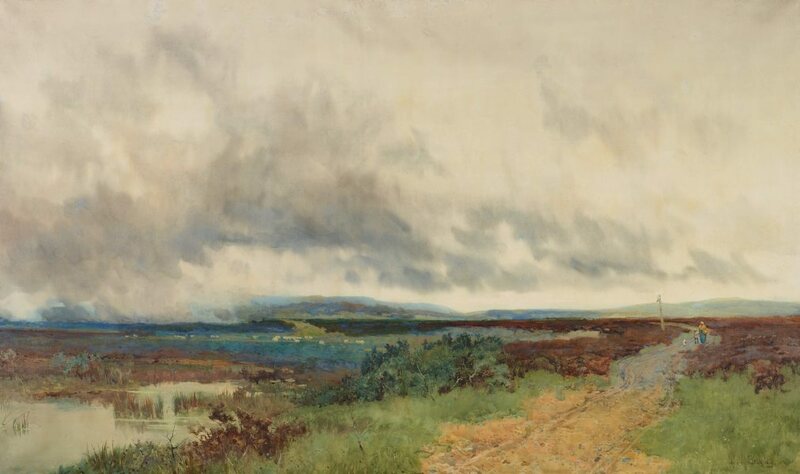 "Landscape" by John Bromley, 1900. 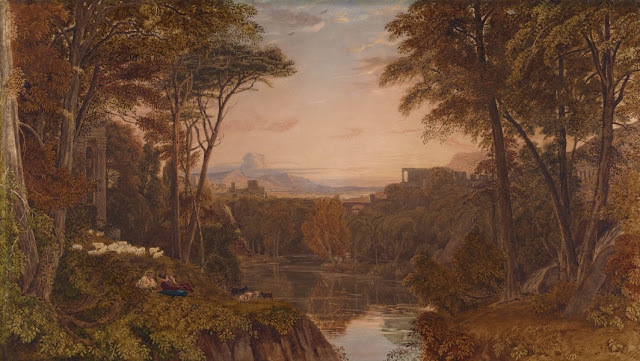 "Classical landscape" by George Barret Jnr, 1820-1830s. 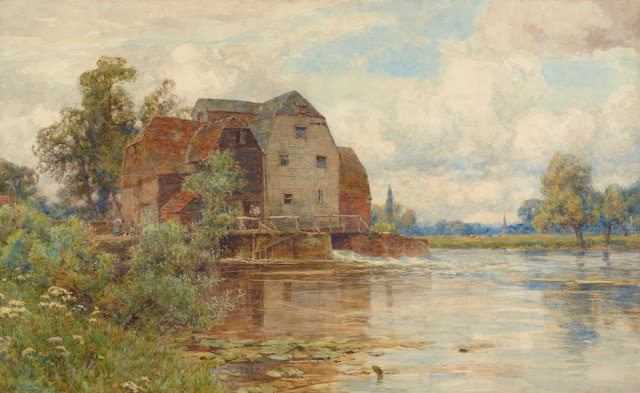 "The mill pool, Hemingford Grey" by Sir Ernest Albert Waterlow, 1902-1904. 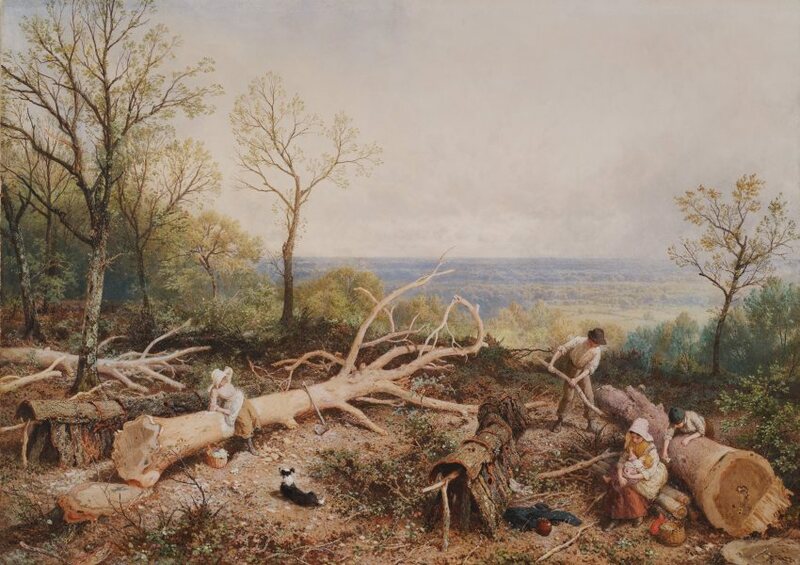 "Peasant child's funeral, Chioggiaby" Alexandre Nicolaïevitch Roussoff, 1882. 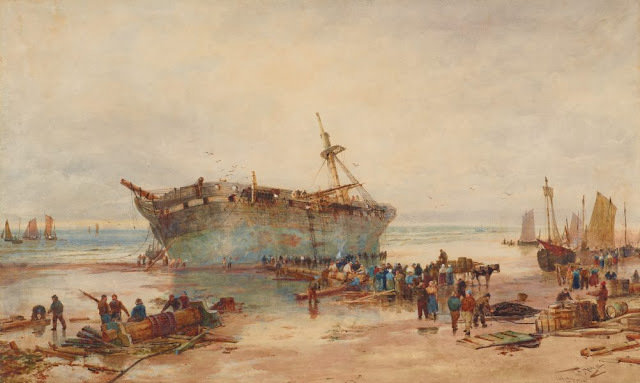 "Clearing a wreck, coast of Picardy" by Thomas Bush Hardy, 1884. 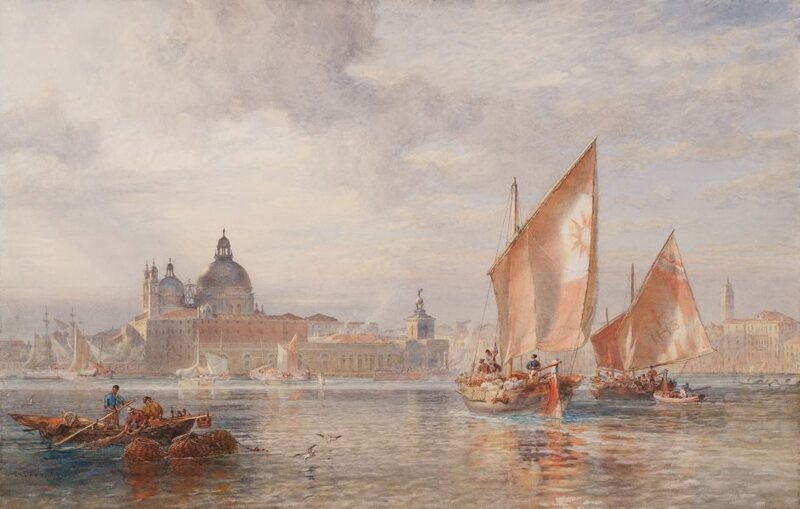 "Weather clearing after rain, Venice, fruit boats going to the Rialto" by Sir Oswald Brierly, 1883. 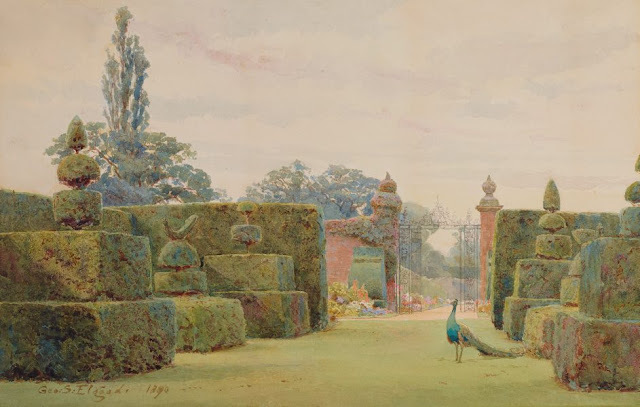 "The yew garden" by George Samuel Elgood, Arley, 1890. 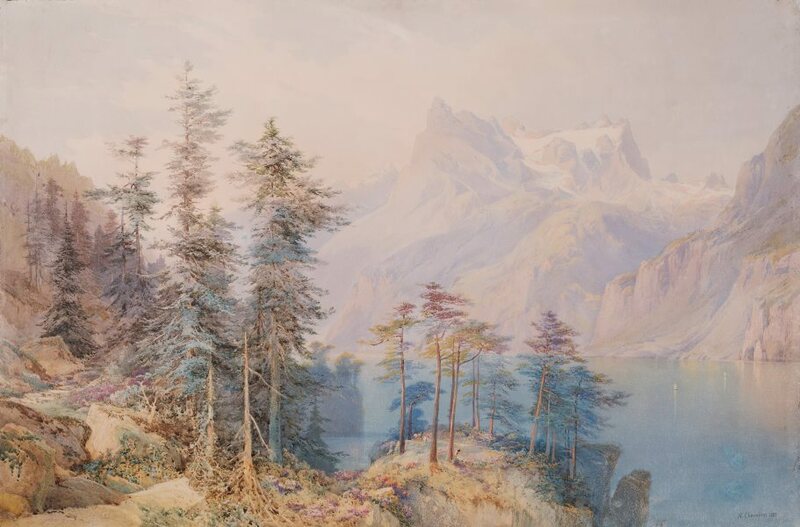 "Lake Lucerne" by Nicholas Chevalier, 1883. "Trundling the cheese" by Robert Thorne Waite, 1887. 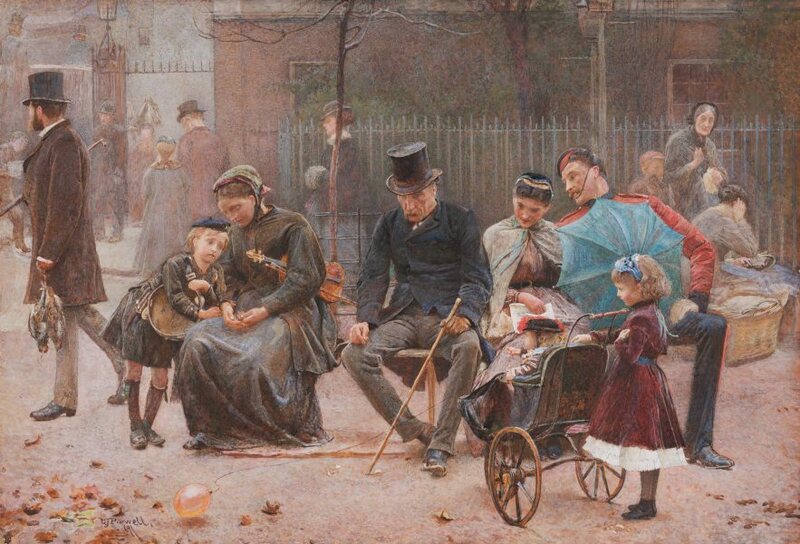 "A seat in St James's Park" by George John Pinwell, 1869. "A sketch, coastal scene" by John Henry Mole, 1867. "Barking, Springtime" by Myles Birket Foster, 1885. 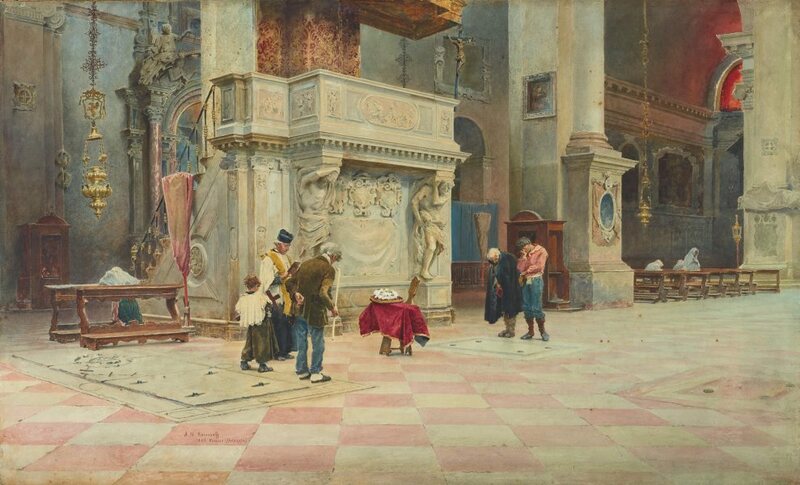 "Interior of Toledo Cathedral, tombs of Don Álvaro de Luna and his wife" by Pilford Fletcher Watson, 1888. 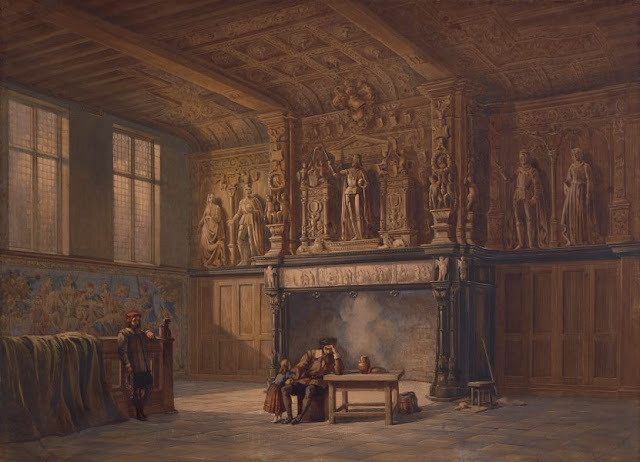 "Interior of the Hall of Justice, Bruges" by John Chase, 1846. 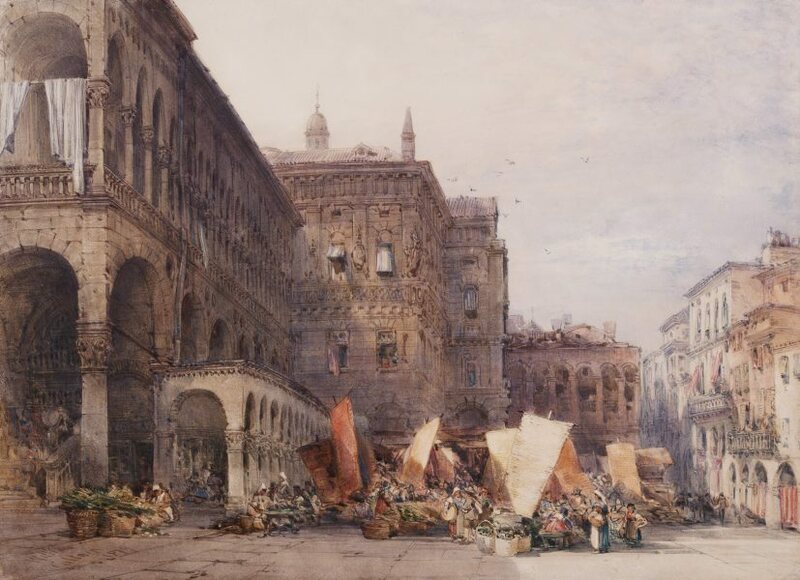 "Town hall and market place, Padua, early morning" by William Callow, 1879. 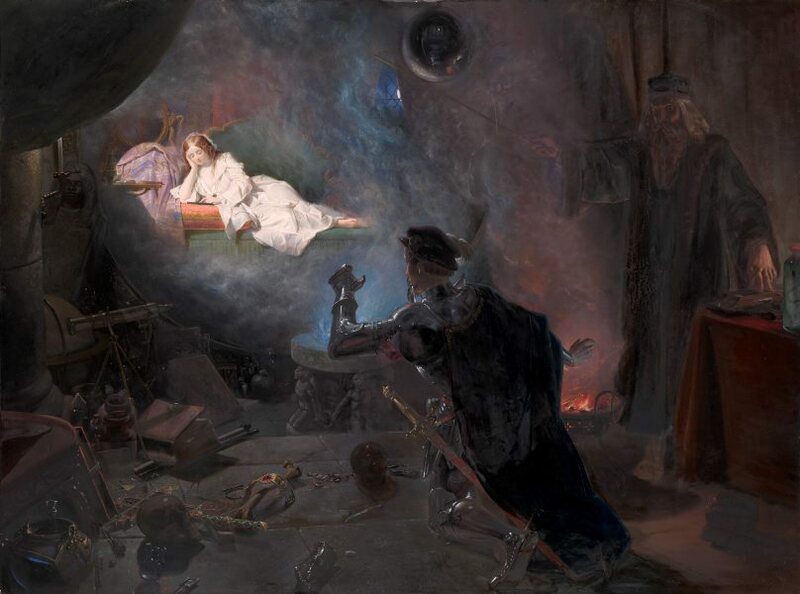 "The magic mirror" by Edward Henry Corbould, 1853. 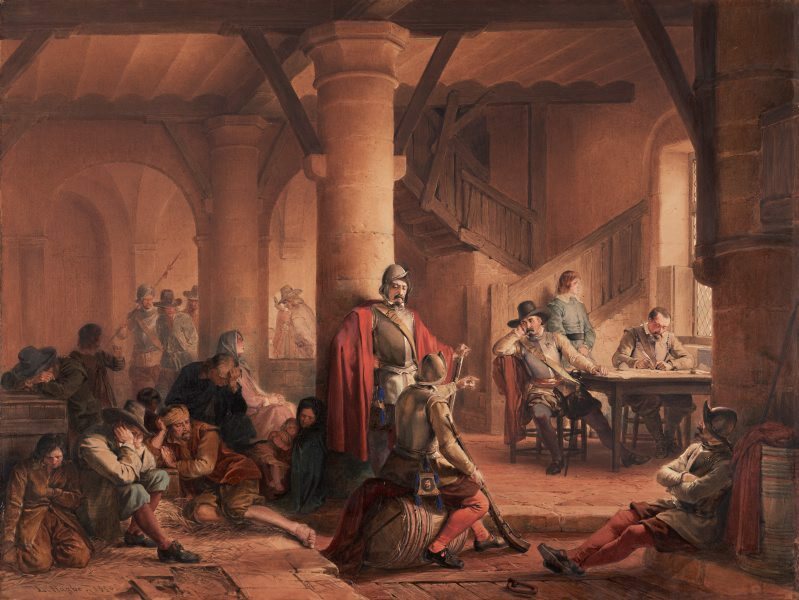 "The miseries of war" by Louis Haghe, 1850. "Early morning, Boulogne" by Hector Caffieri, 1890.